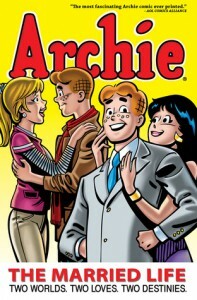 If you want to read about Archie and the gang having real adult problems, this is your stop. Moose is in anger management, Archie and Veronica have marriage problems, Chuck is jealous of Nancy's comic book success, Reggie can't hold a job, and Midge is dating... Jughead? These are just some of the bizarre real life situations in either the Archie Marries Veronica OR the Archie Marries Betty alternate realities. This comic book took me much longer to read than I expected because it is an actual continuous graphic novel and not just Archie shorts, and I really enjoyed it.